Service Now literally has your back when ergonomic evaluation requests are this fast and easy. You can also request office supplies, report broken furniture or building issues, and even request new snacks. 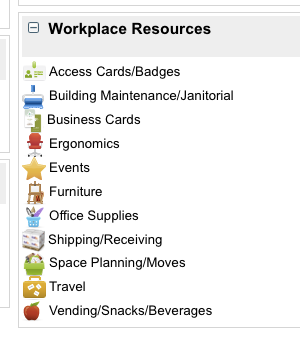 Workplace Resources service requests can easily be filed from the main page in Service Now. Service requests are easy to make, edit and close. You’ll receive updates from the WPR team as we make progress on your ticket, and you can add and respond to our changes as we go. Please help us serve you best by filing your requests in Service Now today!